By No Trump Military Parade. Above photo: Graphics by Diane Dutra. UPDATE: CNBC is reporting that President Donald Trump’s military parade is estimated to cost $92 million, citing a U.S. defense official with firsthand knowledge of the assessment. This is a massive increase in the estimated cost, which was $12 million. The parade is scheduled for Nov. 10 in Washington, DC, and will feature armored vehicles, aircraft fly-overs, and period uniforms. The number of organizations signing on to the letter opposing the military parade has increased to 200 and continues to grow. Your organization can sign on here. A network of 187 organizations has come together to urge a mass protest against the military parade in November called for by President Trump. [Since this article was first published the number has increased to 200 and continues to grow. Your organization can sign on here.] The military parade is widely opposed. Army Times conducted a poll of its readers; 51,000 responded and 89 percent said, “No, It’s a waste of money and troops are too busy.” A Quinnipiac University poll found 61 percent of voters disapprove of the military parade, while only 26 percent support the idea. The national consensus is there should not be a military parade. The organizations signed on to a letter that calls for the parade to be stopped, “We reject this gross display of power and violence. We call on you to stop the military parade.” If the parade goes forward, the organizations will urge their members to come to Washington, DC to protest the parade or to organize sister-protests in their communities. Urge organizations you are a member of to sign on. This is an issue that impacts the economy, jobs, the environment, as well as wars and militarism. Sign on here. The groups call on the nation to divest from war and invest in peace. The United States’ military budget is growing, now constituting 57% of federal discretionary spending, while programs for domestic needs such as food, education, housing and health care are being cut and US militarization is impacting most of the countries of the world, as well as our schools and communities. President Trump plans to spend more than $10 million dollars to parade troops and military vehicles and weapons through the streets of Washington, DC on Veterans Day, which this year is the 100th anniversary of Armistice Day. Armistice Day used to be a day to reflect on the impacts of war and to build toward war no longer being an instrument of foreign policy, not a day to glorify war with a military parade. Veterans and military families are organizing a solemn march in DC on November 11 to remember those who have been killed, both soldiers and civilians, and the 20 veterans who commit suicide every day and to reclaim Armistice Day. While it is President Trump who is calling for the parade, both major political parties are responsible for escalating US militarization and aggression throughout the world and in the US. Members of Congress voted nearly unanimously to give the Pentagon a record $716 billion budget and are complicit in escalating tensions with Russia, North Korea, Iran, Nicaragua and Venezuela, among others. Many groups are organizing to stop this parade, reclaim Veteran’s Day as Armistice Day and call for demilitarization and investment in programs that protect and support our communities in positive ways. The people of the United States need to show the world that we do not support never-ending war and aggression by our country. We urge people around the world to create sister-protests at US embassies to show their opposition to US militarism. The US military is the largest carbon emitter in the world and in this era of climate change, there should no longer be wars for oil. This is one example of many of how militarism impacts other issues. Opposition to war spending and military activity needs to unite movements for a transformational change in US foreign policy. The organizations intend to make the response in opposition to President Trump’s military parade bigger than the parade itself. Events for the weekend include a “Peace Rocks” Concert organized by CODEPINK on Friday, Nov. 9; along with Catharsis on the Mall, a Burning Man-like vigil for healing. The protest of the military parade will be on Nov. 10. This will be followed by the veteran and military family-led solemn march through the war monuments on the mall on Nov. 11 at 11:00 am to recognize the 100th anniversary of Armistice Day. 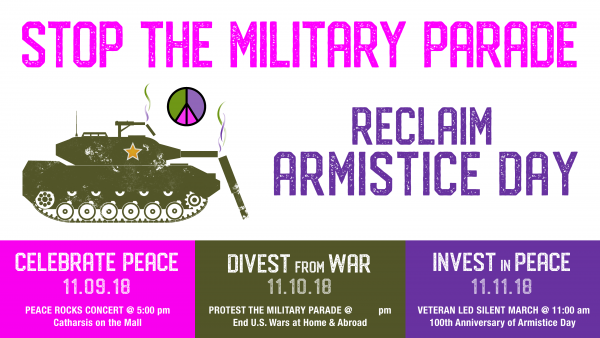 The Anti-war Autumn will be kicked off by the Women’s March on the Pentagon on October 20 and 21, followed by a daily vigil at the Pentagon to connect the Women’s March to the protest against the military parade. For more information, visit www.NoTrumpMilitaryParade.us.